The 2016 National Historic Vehicle Survey has been extremely effective in presenting new updates to the sector that deliver far greater understanding and focus on the issues it faces moving forward. There are many conclusions that can be made from the findings of the survey – the key headlines have been drawn together below for the reader to digest. The full 2016 National Historic Vehicle Survey report is available from the Federation of British Historical Vehicle Clubs and can be found on their website. More than 8 million people in Britain have at least some interest in historic vehicles – be it owning, reading about them, visiting events, or maybe simply enjoying them when they drive past on the road. This equates to around 1 in 6 adults and a clear illustration of the mass appeal of the sector as a whole. Nearly half the British adult population (48%). or an estimated 25 million people, think historic vehicles should be preserved for people to enjoy in the future. A similar number (23 million) see historic vehicles as an important part of Britain’s heritage. These findings show there can be no doubt that the sector represents a unique window on our motoring history and that many people support and encourage their preservation today. Findings further reveal 1 in 3 (32%) adults think historic vehicles should be used rather than sit unused in a museum, with 1 in 5 (an estimated 11 million people) going further and agreeing that historic vehicle owners should be actively encouraged to use them on the road. These findings create a compelling case for ongoing use of historic vehicles today. 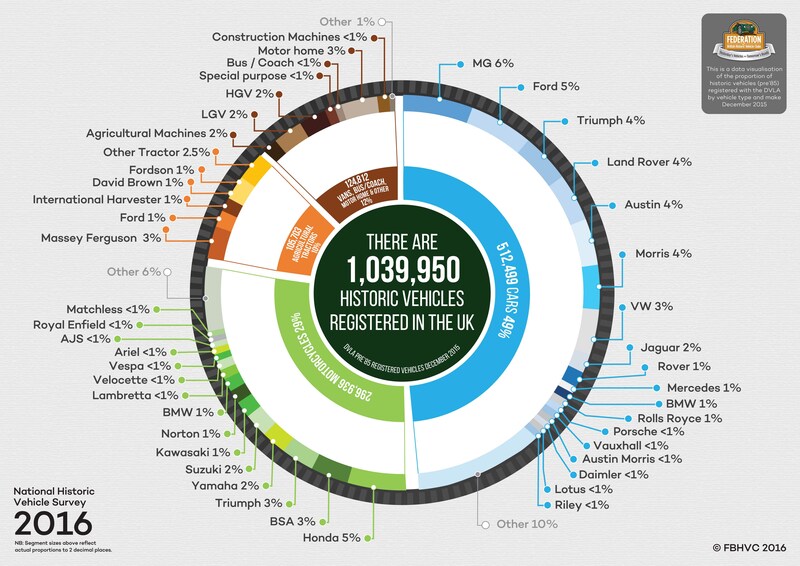 There are more than 1 million vehicles registered before 1985 in Britain. We use this as our proxy for historic vehicle numbers. They span the range of vehicle types – including cars, motorcycles, buses and coaches, lorries, military, steam and agricultural vehicles. This estimate is 18% higher than in 2011 (850,000) and constantly growing over time. Nearly 6 in 10 (58%) historic vehicles are licensed for ‘on road’ use. Two in three (65%) historic vehicles are in concours or very good condition and complete an estimated 676 million miles per annum. We estimate there to be around half a million individual owners of historic vehicles, and a further 1.5 million ‘highly interested’ enthusiasts who spend both their own time and money on pursuing their hobby. The value of all historic vehicles in Britain today is estimated at £17.8 billion. More than 9 in 10 (94%) historic vehicles have some form of security in place, although most commonly this means being locked in a garage (84%), rather than having an installed alarm (9%), tracker system (2%), or security markings (2%). International trade (i.e. exported products and services) is growing as a proportion of turnover for British companies providing services to the sector – it is now estimated at 25%, up from 20% in 2011). This equates to an estimated £662 million per annum spent in Britain by foreign historic vehicle enthusiasts. The trade remains optimistic about future growth in turnover. Historic vehicle related employment has risen to 34,900 from 28,000 in 2011 – a 25% increase reflecting the growing spending, increased vehicle numbers and the positive attitude of businesses towards future turnover growth related to their historic vehicle activity. The industry provides more part-time jobs (7,600) and trainee/apprenticeships (3,800) than ever before, but skill shortages remain with 40% of employers struggling to find skilled staff. This scenario looks set to continue with 1 in 2 employers anticipating difficulties recruiting skilled staff in the future. More than 6 in 10 (61%) employers in the trade remain concerned that regulation connected to historic vehicles will present a problem for their business moving forward. Little has changed since 2011 when similar proportions of employers (68%) had the same concerns. The Federation were able to kick the ball off with data relating to historic vehicles from the DVLA as summarised here.